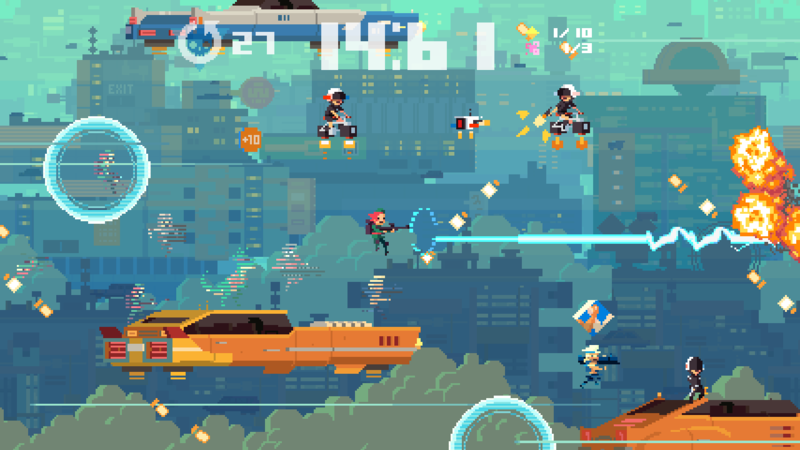 This weekend, while I had time to relax, I played Super Time Force on the Xbox One! I can’t write a proper review of this game, since it’s an exclusive and with Microsoft Studios, and I now work for Microsoft. 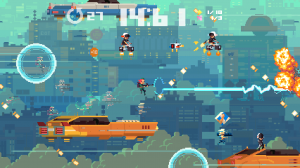 But let me say, totally as an objective human being and not a representative of a corporation, that Super Time Force was awesome. The level design is good, the graphics are crisp, the writing is sharp and the music is good. The game is really dense with a lot to talk about. In particular I want to talk about the ending, though, and that means, spoilers! Hey, and I’m also going to be spoiling the end of Virtue’s Last Reward, and BioShock Infinite, and inFamous, and also Saints Row 4 just for good measure. So what do most of the games I listed above have in common? They all have some kind of time travel element. And then most of them (except Saints Row) because they have a time travel element, have the twist ending where The Bad Guy Is Also You! 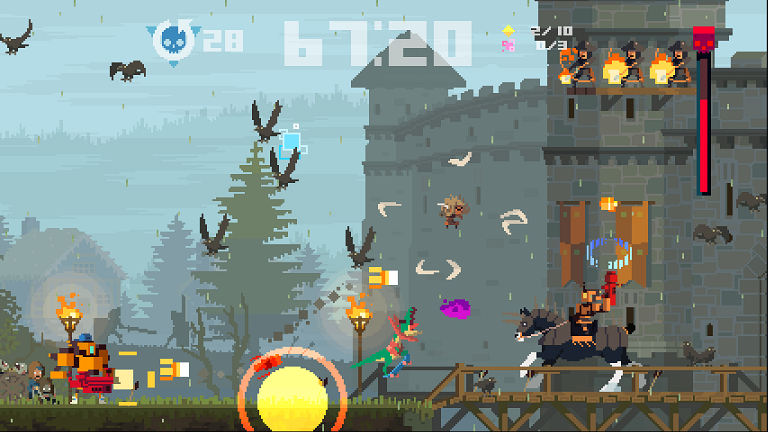 This was entirely predictable in Super Time Force (the bad guy not being “you” specifically but being your commander, who is playable in the final level, so close enough), and not even particularly well hidden, and I have to say: that is pretty damn brilliant. We’ve finally reached the point where The Bad Guy Is Also Your Character is a twist you can parody. This is good, because The Bad Guy Is Also Your Character is a twist that has never not made me groan a little. In inFamous, it’s out of nowhere and completely unearned. In Binfinite, it’s not exactly out of nowhere, but it still feels kind of disappointing: “what, really? Blehhhh.” Virtue’s Last Reward did it pretty well really! But I had played so many video games where that was the twist, that I still saw it coming anyway. Ghost Trick – oh sorry, oops, I’m spoiling another game, skip the rest of this paragraph maybe – did a really good variation, where the bad guy wasn’t you exactly but was just the person you thought you were, but I guess I am mildly obsessed with that game. And Soul Reaver (sorry, sorry) did that thing, but that was really pretty good because it was also different? (Was that vauge enough?) But it comes to the point where if there’s any hint in any game at any point of a time travel element I can rest assured that the final boss will be some version of myself. Which is what brings me to Saints Row 5. Because if you finished Saints Row 4, you know that the game ends with a time travel hook. But hey, having a game where the silliness of this twist is acknowledged and then the problem is solved by having two alternate versions of the same character just hug it out is also more than I dreamed of. I actually haven’t ruined anything about Super Time Force by mentioning this, so if you still read all this without playing it yet, play it! If you read all this but have no means to play it, use the comments as a space to list any times when The Bad Guy Is You, Because Time Travel is a thing in a game. (If there’s a TV Tropes Page for this or something that is not what I mean; I specifically only mean this twist in video games.) We can also use this space to lament about how hard it is to write about the endings of games, especially comparing and contrasting them, without feeling like a huge jerk, and thus makes discussing this twist in particular so incredibly difficult. And therefore how our lack of abilities to truly discuss the endings of games means that stupid things in endings may continue to go unchallenged by critics who are otherwise just trying to be polite to their audiences.